The 1960 Agadir earthquake (Mw 6.0) constitutes the most damaging earthquake event in Morocco. With the expansion of seismic networks during the last decade in Morocco, new seismic data have been collected in this region. The P and S arrivals at 19 stations located in Southern Morocco are used to investigate the lithosphere in the Agadir region. In this study, we use a linearized inversion procedure comprising two steps: (1) finding the minimal 1-D model and simultaneous relocation of hypocentres and (2) determination of local velocity structure using linearized inversion. The model parameterization in this method assumes a continuous velocity field. The resolution tests indicate that the calculated images give near true structure for the studied region from 0- to 45-km depth. The results show that the total crust thickness varies from 30 to 40 km in SW High Atlas and confirm the modest crustal tectonic shortening and thickening in the Atlas Mountains of Morocco. The inferred geological structure reconstructed from the calculated image illustrates the existence of fault-related folding. 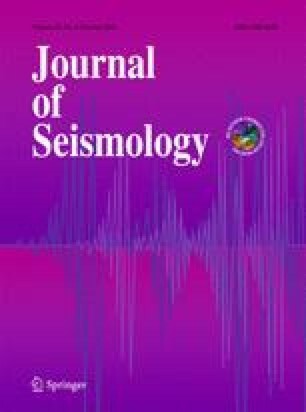 The evidence for coseismic ruptures in 1960 on the Kasbah anticline combined with the 1960 earthquake hypocentre located in the tomographic image determines the seismic potential of the active fault and related fold. The resulting tomographic image shows a high-velocity anomalies that could be associated with the location of deep active fault (10–30 km) associated with the fold structure. In the South Atlas, theses anomalies could be associated with the South atlas thrust front structure. This study was supported by the CNRST, PROTARS D15/41. Some of the figures were prepared using the public domain GMT software (Wessel and Smith 1998). Topography in figures is from GEBCO_nc8 and SRTM 3-arc-second (∼90 m) digital elevation model (Farr and Kobrick 1998).